The survival of human life is dependent on some matters. Of them, water is amongst the most essential. Water shortage affects human life immensely. It may even completely end it, if it is severe enough. The concern over water shortage in Pakistan is ongoing, over the last three decades. According to some international research institutes, by 2025, Pakistan will be included in the list of countries with extreme water shortage. Access to water will become more difficult for its increasing population. It will compromise the development of agriculture. Despite Pakistan possessing all manner of abundant resources, both civil and military governments formed under the capitalist system have neglected this important issue. Indeed, the current regimes of the entire Muslim world have neglected the important issues of the Muslim Ummah. The regimes deflect blame onto others, to avoid blame being directed upon themselves. Capitalist governments in Pakistan have often blamed India for causing water insecurity. They have accused provincial leaders over safeguarding their personal and political interests. They have blamed the population in general for its irresponsible and inefficient use of water. Today, unfortunately, this problem has become so severe that the former head of the judiciary himself, Chief Justice Saqib Nisar, started a campaign to build a dam. To make it successful, he had to invest his personal time, even though there are hundreds and thousands of cases pending in Pakistan’s judicial system, some many years old. And he directed himself to address water shortage, even though he himself accepted failure in bringing reforms to the judicial system left by the English imperialists. Questions arise in the mind. Is Pakistan really facing a water shortage? Is the Indian aggression over water really the main reason? How much of the aggravation of this water issue is due to the incompetence of successive capitalist governments? This article aims to provide answers to these questions. This article discusses some technologies and resources, particularly the ones that solve water shortage issue in the agriculture sector. Also, it seeks to shed light as to how the Khilafah (Caliphate) will solve these issues by utilizing the latest technologies and resources inshaaAllah. Regarding a possible Indian role in this issue, we have clear teachings in the Quran that the Jews and non-believers will be the worst enemies of Muslims. It is not a surprise that our non-believing neighbor has never wasted any opportunity to make things difficult for the Muslims of Pakistan. To understand Pakistan’s water issue, we need to look briefly at the division of the Indian Subcontinent in 1947. At the time of the partition of India, based on the Hindu and Muslim population, the eastern part of Punjab was given to India, whereas western Punjab became part of Pakistan. The two districts of Firozpur and Zira of Indian Punjab that are connected with Pakistan, were initially given to Pakistan, due to their Muslim majority population, as per the Radcliffe Award, that highlighted the distributed areas, demarcating the Radcliffe Line. The Radcliffe Award was to be announced on August 13, 1947, but it was intentionally postponed for few days and then announced, later, on August 17.During those four critical days, there were changes made in the Radcliffe Award that directly hurt Pakistan, the newborn state. One such change was that both these Muslim majority districts, Ferozepur and Zira, were given to India. If these districts had been given to Pakistan, then it would have controlled areas far beyond the banks of the River Sutlej. Pakistan would not only have had the head works of Ferozepur Barrage and Dipalpur Canal, that irrigate Pakistani territories, it would also have controlled the Ganges Canal that irrigates many areas of Indian Rajasthan. In such a scenario, the outcome and basic foundation of 1960’s Indus Waters Treaty, that violated Pakistan’s water rights, would have been completely changed. Pakistan would not have to withdraw itself from the waters of the three eastern rivers, the rivers Sutlej, Beas and Ravi. However, the political leadership of Pakistan at the time did not protest over the forceful handover of these districts to India. It did not take any concrete steps whatsoever to redress the wrong. It was merely content in accepting whatever was given. The political immaturity of our leaders at that time irreparably damaged Pakistan. However, the story doesn’t end here. On 31 March 1948, India closed a canal system, now called Central Bari Doab Canal that provided water to Pakistan. One of its branches used to cross Lahore and the other main branch crossed Lalyani Point on Ferozepur Road, which irrigated the whole Lahore Division. After this, on April 15, which is just a fortnight later, the Dipalpur Canal coming from Ferozepur headwork, located in the Indian district of Ferozepur, was also closed. The Dipalpur Canal irrigated a broader area in Pakistani Punjab region. With the sudden closure of this canal, hundreds and thousands of migrants were affected immensely. They were temporarily settled around the vast areas of agricultural land by the government of Pakistan. Moreover, the ready for harvest wheat crop was destroyed and rice, cotton, and sugarcane crops were not planted. The closure of these important canals made Pakistan’s political leadership realized their mistake for the first time. But by then it was too late. Instead of using military might, once again the ineffective path of negotiations was chosen. A delegation of Pakistan’s then finance minister, Ghulam Muhammad, and two other ministers, Mumtaz Doltana and Sardar Shokat Hayat, went to India. Discussions were started to open these canals. On May 4, 1948, a treaty was signed that was thought to be a solution to this problem. However, this solution proved more damaging than the problem itself. According to this treaty, the Indian right over all this water was accepted, in exchange for re-opening the canals. An agreement was reached that Pakistan will build alternate resources and new canals. Until then Pakistan would pay India for all the expenses for providing water in Pakistani areas, through the existing canals available back then. This is how the water that was used to irrigate areas in Pakistan and produce hundreds of thousands of tons of food crops, was handed over to India on a plate. Instead of briefing the whole nation about the reality, the delegation upon their return tried to cover up their incompetence, announcing a water emergency. The construction of the current BRB canal was announced on an emergency basis. The aim was to use the River Chenab’s water to irrigate the vast areas of agricultural land in Pakistani Punjab, which previously was irrigated through the canals now controlled by India. The construction of the BRB Canal was presented as an important national obligation. Through Radio Pakistan, newspapers and speeches of political leaders, the patriotism was incited within the people. The importance of canals was emphasized and the animosity of the Hindu state was presented as a cause. Both male and female students were called upon to dig the canal. It is akin to the construction of Bhasha Dam today. Emotions of patriotism and stunts like announcing a water emergency are used to exploit the private wealth of Pakistanis as state resources. However, even the construction of the BRB could not fulfill the water requirement that used to come through the canals that were now under the control of India. Lilienthal then recommended that the World Bank solve this crisis and reach an agreement, along with the experts from both Pakistan and India. Eugene Black, the then World Bank President, contacted the governments of both nations. Discussions went on for ten years over the Indus Waters Treaty. On many occasions, Pakistan felt that many provisions in this agreement favor India over Pakistan. However, after a few changes and amendments, an agreement was reached and Pakistan’s President, Ayub Khan, and Indian Prime Minister Nehru signed the agreement, under the supervision of the World Bank, in Karachi. Looking at the details of this agreement, any sane mind can sense the political immaturity and incompetence of Pakistan’s government and institutions. In 1948, India was only claiming its right over canals from whom 20% of the water flowed in India, whilst 80% flowed in Pakistan. However, in 1960’s Indus Water Treaty, Pakistan not only accepted India’s right over these canals, it also accepted India’s right over three rivers Sutlej, Beas and Ravi. These were those rivers which had a combined annual water flow of thirty-three million acres ft. Twenty-five million acres ft. was used by Pakistan and only eight million acres ft. by India. After this agreement Pakistan completely lost its rights on these three rivers. Out of the three rivers that Pakistan was granted, Jhelum, Chenab, and Indus, the origins of two, Jhelum and Chenab, were in Indian Occupied Kashmir. Under this agreement, Pakistan was also bound to start constructing alternate canals from western rivers to irrigate those areas that were previously irrigated through the eastern rivers, Sutlej, Beas, and Ravi. Moreover, Pakistan had to endure the tortuous task of constructing dams on its western rivers, as well as building canals and water channels on the Indus River, to irrigate its agricultural land. Many years and billions of dollars were spent on this work. Under World Bank supervision, 1.3 billion dollars was collected from six countries, of which some was given to Pakistan as financial aid and some as a loan, so that it could build irrigation canals on the western rivers. The six countries were the US, Canada, Britain, Germany, Australia and New Zealand. In contrast, for only 62,060,000 British Pounds, India was permanently given the three eastern rivers, including the canals it usurped previously, even though 80% of the water from these three rivers used to flow in Pakistan. India was awarded these three rivers despite the fact that it already had another nine large rivers, with countless tributaries. It also had a previously constructed canal system that irrigated almost all areas of India. The World Bank was made to play the role of a decisive arbitrator in case of any dispute between the two countries over this agreement. It can be clearly seen, in this agreement that India was clearly favored in all sorts of ways. This is why India does not want to break this agreement with Pakistan, despite fighting three wars and engaging in countless disputes. This agreement gives it great benefits, whilst giving it a chance to control Pakistan. Despite this agreement, India has either built or is constructing over half a dozen projects to store water or produce electricity on two of Pakistan’s rivers, Chenab and Jhelum. Most are in violation of this agreement because these projects slow down the flow of Chenab and Jhelum in Pakistan. Despite Pakistan’s protest, the World Bank has failed to persuade India to terminate those projects. The background of the role of international powers in the Indus Waters Treaty can be understood in light of the fact that in the fifties of the last century, Pakistan started tilting towards the US. After Ayub Khan came to power, Pakistan was firmly tied to the US. In contrast, the Indian Congress Party government was under Britain’s influence. The US wanted to strengthen Pakistan against India and so was concerned over Pakistan’s water issue. However, at the time, the World Bank was more influenced by Europe, rather than America. This is the reason why the World Bank’s arbitration benefited India more. Today, American priorities and interests have changed in the region. India is also under US influence through the BJP government. It is in America’s interest to keep Pakistan weaker and support India as the dominant regional power that over-shadows Pakistan. It is now necessary to assess whether Pakistan has sufficient water every year to cater for its agricultural needs, despite the above mentioned factors. The available facts and figures clarify that Pakistan’s water shortage issues are not due to the shortage in supply, but due to the water wastage. There has not been upgrading and repairing of the existing canal system that was built way back in the sixties of the last century. There is also an unjust distribution of water, as well as apathy, incompetence and greed of state organizations. Another major factor is the lack of trust between provinces and with the center, which is deeply rooted in the federal way of government. Pakistan Indus Water System, that includes Jhelum and Chenab rivers, brings approximately 144-million-acres-ft. of water annually, due to rain and melting snow. Out of this, 104-million-acres-ft. of water is channeled, for our agricultural needs, through an irrigation system comprised of dams, barrages and canals. The remaining 39-million-acre-ft. water goes to the sea, after passing through different areas in Pakistan. A lot of water allocated for agriculture gets wasted due to the obsolete canal system. None of the successive military and civilian democratic governments made serious efforts to improve or upgrade the canal system. Due to not ‘lining the canals,’ i.e. ensuring that the floor and surrounding of canals are made strong enough to prevent water seepage, we lose a staggering 44-million-acres-ft. out of the 104-million-acres ft., before it even reaches our fields and crops. Water research reveals that weak or unlined canals lose 30-50% of the water within it, before it reaches its destination. Moreover, the water leaked from the canal floors and sides is absorbed and results in waterlogging and salination in the agricultural and residential areas nearby. Three million-acres-ft. is lost due to evaporation and other issues. A large portion of the remaining 57 million-acres-ft. that reaches fields and crops is then unnecessarily lost, because there are no government institutions to train farmers as to how to avoid wasting water. Moreover, the latest technologies to conserve water are not used. Areas that are far from canals receive less water because of this wastage. Often farmers do not receive natural flowing water. The other reason that these affected farmers receive less water is the presence of powerful landlords that are nearer the canals. They are able to waste and use more than their share on their lands, due to the corruption or incompetence of government officials. This forces a large number of small and poor farmers to resort to tube-wells, using underground water to overcome this artificial shortage. 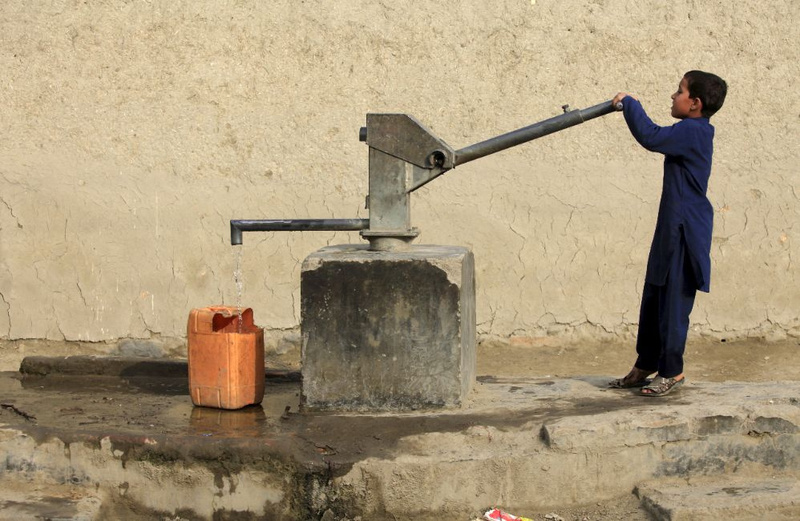 According to an estimate, there are more than 550,000 tube-wells that are using underground water, exhausting the underground water table to dangerously low levels. Approximately 42 million-acres-ft. of water is being taken out every year for agricultural and drinking purposes. However, if the government upgrades the canal system, lines canals and uses the latest technology, then extracting underground water will rarely be required. We can then fulfill all our needs from the available 104 million-acres-ft water. As far as the water crisis in Karachi is concerned, this issue has nothing to do with water shortage. It is due to the collusion of the tanker mafia, government institutions and local officials. This tanker mafia is backed by greedy and self-centered leaders. Thus, the inaction of government officials to take serious measures to solve the water issue benefits the tanker mafia. By creating an illusion of an artificial shortage, people are forced to buy water from the tanker mafia at extortionate rates, to fulfill their personal water requirements. One water tank in Karachi sells between 2500 and 3500 Rupees. Usually, water is supplied to Karachi via the Hub dam. In the past, when dam water levels were low, due to fewer rains, then water from the Indus River was channeled through a waterway and supplied to Karachi. However, in recent years, whenever there is a shortage of water in the Hub Dam, water from the Indus River is no longer channeled. Instead nothing is done to alleviate the issue, forcing the people to buy water from the tanker mafia. In many cities other than Karachi, shortages in water for drinking and personal consumption are mainly due to the fact that government organizations are incompetent or corrupt. Even in Pakistan’s capital, Islamabad, water shortage becomes a huge problem for its residents. It is due to this incompetence and corruption in the government, there are many large capitalists who have made bottled water companies. In the name of providing clean, potable water, they supply the same water that was their right, whilst filling their bank accounts with millions of Rupees. The issue of dam construction in Pakistan causes a severe conflict between provinces and the central government. This is a purely technical issue which should be resolved in light of the recommendations given by technical experts. The center’s standpoint has always been that even if there was no additional water that gets wasted in the sea, then water from floods destroys agricultural lands before ending up in the sea should be stored in large and small dams. Dams will produce cheap electricity and provide water for agriculture as and when required. Dams reduce the impact of floods and hence the damage caused to agriculture land and crops is minimized. The two biggest dams in Pakistan are Mangla and Tarbela dams. Including other small reservoirs, they can accommodate a total of 17 million-acres-ft. of water, even though their capacity to store water is decreasing every year due to silting. Mangla and Tarbela have reduced their storage capacity by 33% due to silting. Building new dams will lower the pressure on the existing dams. They will also reduce silt levels and thus increase the life and storage capacity of existing dams. Based on this reasoning, the new government initiated a campaign to build a dam, but it does not have funds for it. So it will now seek to fund the dam by borrowing interest based loans, worth billions of dollars from international organizations, or impose more back breaking new taxes on people. It will thus cause more inflation for decades, having to repay these loans with interest and depreciating the Rupee as a loan condition. It will now again exploit people in the name of patriotism by causing fear that if they do not contribute now, their future generations will suffer as a consequence. The new government has used this second method already to collect some funds. However, 1400 billion rupees is required for the Diamir Bhasha Dam alone. It would take decades to collect this amount from the people in this way. The process of constructing the dam has become expensive also because in seven decades the capitalist governments have never structured or trained our institutions in such a way that we have local technology and experts. Consequently, we have to look to international organizations and foreign nations to fulfill the technological and expert requirements of these mega projects. Foreign experts charge a hefty fee and the government’s focus on collecting this from the overburdened people would be funny, if it were not so cruel. In Pakistan’s seventy-year history, whenever there were difficult times or difficult decisions to be made, its noble people always supported the government. However, when these oppressed but sincere people turn to these incompetent rulers for the solution to their problems, these rulers are nothing but a bitter disappointment. Another major issue in constructing dams is the conflict between provinces and with the center. The reasons for these conflicts are more due to the lack of trust than technical issues. Lack of confidence is the specialty of the democratic and capitalistic system, because each grouping, lobby or faction participating in this system tries to maximize its own benefit, as much as possible. Whenever this happens, the rights of others are generally compromised, particularly the interests of other groupings and peoples who are already suffering from numerous problems. Similarly, the consequences of delays negatively impact people the most, just as the people of Pakistan are suffering in the case of delays in dam construction. For the last twenty years, the capitalist rulers of Pakistan have raised the false alarm of water shortage. However, especially in the field of agriculture, these rulers neither took support of the latest technology to solve the water shortage or to protect agricultural production from being affected. They also did not make any serious efforts to make the latest technology available to farmers. This is even though many developed and even developing countries have utilized the latest scientific inventions and resources to increase their productivity, despite water shortages. Qemisoyl technology is one of the useful innovations. Qemisoyl is a white granular water-absorbent polymer powder specifically designed to absorb and retain large quantities of water and nutrients for use in agriculture, horticulture and, forestry. Qemisoyl hydrates upon contact with water and turns into a transparent gel. It serves as a reservoir for water and later passes the water to the plant roots when needed. Each gram of Qemisoyl absorbs up to half a liter of distilled water and increases its weight by up to five hundred times. In cultivated soil, a gram of Qemisoyl absorbs, on average, 200-300 millimeters of running water, depending on the salt and mineral content of the soil. Due to its reversible properties, 95% of the retained water will be accessible to plant roots, minimizing loss through evaporation. While transferring water to the plant, these particles reduce the density of the soil. Thus they ensure that air and water are more easily accessible, which also helps in an increase in productivity. The Qemisoyl particles are capable of repeatedly absorbing a half liter of water, whilst transferring water to plants and returning to the original one-gram weight. They are re-usable for four to five years after being deposited on land. They are an ideal remedy for agriculture in the areas of little or no rainfall, as well as water shortage affected areas, in Baluchistan and Sindh. Qemisoyl’s price is also within the reach of farmers in all areas. Facts and figures reveal that Qemisoyl increases agricultural production by 20-27% per hectare. It also solve water shortage problems by 40-50%. Moreover, Qemisoyl is biodegradable and so becomes part of the soil upon expiry, without causing any damage. Then, other granular particles can be used to replace them. Yet, another innovation to irrigate land is called the drip irrigation system. Instead of using more water to irrigate the majority of an area, plants and crops are individually irrigated. This method is suitable particularly for fruit farms and for crops where plants are planted at some distance from each other. In this method, each tree or plant can be economically provided with water, within a small diameter around them. There is a network of small valves, pipe, tubes and emitters that are installed either above or below the surface of the land. They release water in a calculated amount and hence water does not get wasted. Yet another method of irrigation is the irrigation sprinkler i.e. through a water sprinkler to water plants and crops. The method works similarly to the method of natural rain. The water sprinkler is fixed in land in the form of a pipe or fountain that propels water as a spray above the plants. Water then falls like rain to irrigate the root systems of plants. A higher pressure variant is called the rain gun. Instead of irrigating a large area of land with a large quantity of water through the ground, a reasonable amount of water is sprinkled, with considerable saving in water. There are many other modern techniques available that reduce the impact of water shortages upon crop production. Moreover, using these resources can increase production. In addition, there is technology available to recycle used water. Such recycling can allow for large amounts of water to be reused. However, in Pakistan there has never been sufficient attention given in this direction. As long as the state is neither encouraging the use of such methods nor training the farmer nor providing them with financial help, our farmers will never develop and our agriculture that produces 25% of our GDP, will always remain in its current turmoil. Thus our rulers are lazy in solving the basic problems of people by adopting from the non-Muslims the scientific research, new inventions and latest technologies that are permissible by Shariah. Yet, these democratic rulers are active in adopting the ruling system and laws from non-Muslims which Allah (swt) and RasulAllah ﷺ have forbidden. With the support and will of Allah (swt), the Islamic Khilafah state will solve the issue of the provision of water in accordance with Islam. It will utilize all available material resources, including the latest technologies that will solve this problem. Today, the lack of trust that people have in democratic rulers is a major hurdle in solving this issue. It is because these rulers exploit the people by imposing and implementing unjust taxes. In return, instead of giving facilities to people, they give them inflation, electricity, water and gas load-shedding, unaffordable education, incomplete health facilities, whilst these politicians increase their own assets and luxuries. The Islamic State will revoke all the unfair, non-Shariah taxes, be it direct or indirect, that have crippled the people. Petrol, gas, coal, and electricity resources will be taken from private companies and put under state supervision on behalf of the public, because according to Islam these are the property of the public. Of course the current heavy taxation upon them will also be abolished. All these will make people realize the economic change in their lives, through the great relief from burden. All these steps, taken by the Islamic state during its initial days, will ensure the people’s trust in the Islamic Khilafah State. The basis of all the government’s actions is Islam, in contrast to the previous set up where the basis is securing the benefit of the capitalist rulers. The people will support and agree with all the state actions, including whether to construct dams or not. They will have total confidence that the Islamic Khilafah State ill neither exploit, nor allow anyone to exploit the people and violate their rights. RasulAllah ﷺ said, «المسلمون شرکاء فی ثلاث: فی الماء والکلاء والنار» “Muslims are equal partners in three things: water, pastures and fire.” Thus, the Islamic state will ensure the provision of water resources for agriculture, as well as clean drinking water, to everyone as it is their right. The canal system will be upgraded. It will be expanded on a modern basis to make water accessible, through different means, to those areas of Sindh and Baluchistan, where people were neglected. If the water supply is difficult in some places, then people will be re-settled in areas where there is no water shortage. To increase agricultural production, the Islamic State will utilize all the agricultural land available in Pakistan and make it cultivatable through farmers and landowners. Also, agriculture-related technology will be affordable for farmers because all the non-sharia taxes on agricultural equipment, fertilizers and pesticides will be abolished. Implementing the Islamic economic system will provide the state with ample funds. The state will use these ample funds to ensure improvements in water projects and canal systems, instead of using the interest-based loans. The Khilafah will structure its institutions and will provide modern science education in such a way that it produces local expertise. It will establish research for the latest technologies for the construction of dams and other mega projects. Hence the reliance on non-Muslim states will be ended entirely.